Trust Me… I’ve seen it all. Having been online since 1996 I can tell you one thing. NOT all websites are equal when it comes to doing business on the Internet. I’ve personally critiqued hundreds of business owner’s sites over the past few years and I can tell you without a doubt, there are SPECIFIC things you need to do in order to get the sale. I’ve literally tested THOUSANDS of different combinations on my own sites and I can tell you, there are very specific changes you need to make to your websites in order to make them pull. 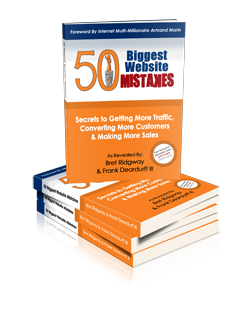 In their book, “The 50 Biggest Mistakes We See Online Business Owners Make”, Bret Ridgway and Frank Deardurff have taken the guess work out of it. They show you specific examples of what TO DO and what NOT TO DO. If you are marketing online, YOU NEED THIS BOOK. It will save you a ton of money and time in avoiding mistakes and it will create incredible income by implementing their techniques. Don’t wait get it right now. This is a MUST HAVE READING!!! 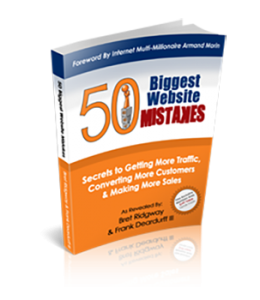 50 Biggest Website Mistakes was written By Frank Deardurff III & Bret Ridgway. The Following information explains more about who they are. Bret Ridgway is co-founder of Speaker Fulfillment Services, a company that works hand in hand with leading information marketers such as Alex Mandossian, Armand Morin, Perry Marshall, Ryan Deiss, Jeff Herring, Mike Stewart, Mike Koenigs, Tellman Knudson and many other well known people. Having handled back-of-the-room sales at Internet and information marketing events for over ten years, Bret has been able to establish close working relationships with many of the top info marketers today and has been behind the scenes handling the fulfillment side of many million dollar plus new product launches. His company has shipped out hundreds of thousands of information products for their clients over the last few years and that unique perspective has enabled Bret to see what information marketers do well – and what they don’t do so well. And it’s those ‘what they don’t do so well’ factors that led to the creation of the original 50 Biggest Mistakes course – The 50 Biggest Mistakes I See Information Marketers Make. 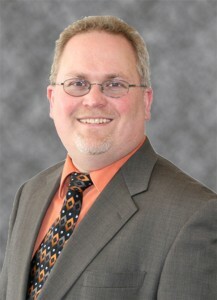 Frank E. Deardurff III, more well known as “That One Web Guy ” is the President of That One Corporation, a Complete Web Solutions Firm located in Terre Haute, Indiana. Frank comments that he has been fortunate to work with and for many top online professionals and authors some of which are Armand Morin, Alex Mandossian, Lorrie Morgan Ferrero, Mark Victor Hansen (Co-Author of Chicken Soup For The Soul), just to name a few. One of Frank’s numerous projects for high profile clients, is Alex Mandossian’s AccessToLeaders.com Within that campaign, Frank built sites for such notable clients as Les Brown’s (AskLesBrown.com), Brian Tracy’s (JustAskBrian.com), and Stephen Covey’s (AskStephenCovey.com). A Microsoft Certified Professional since 1999, and a Certified Novell Administrator since 1996, Frank’s background covers more than 25 years in Graphic Design and Technical Illustration. Successful Internet Marketers seek to partner with Frank on projects, such as Armand Morin with PayBlue, Hostorix & CBClicks.com; Willie Crawford with Change-Web-Hosts.com and Joshua Mitchell’s MasterMindInABox.com. AskDataBase.com, the World’s First and ONLY search engine for survey data was also developed through a partnership with Alex Mandossian. Frank’s expertise has recently found him being invited to impart his knowledge at Live Events, and dozens of Teleseminars and Webinars. Giving back to this Internet Marketing Industry, Frank also takes time to participate in multiple MasterMind groups each week. 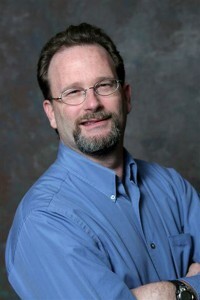 To find more information about Frank’s work, and his well designed courses that are easy to understand as well as extremely thorough in their scope, go to www.FrankDeardurff.com. Learning from Frank will set you above the curve in your Website, Strategy and Marketing education. Watch this video clip from the Valley Business News featured on ABC and learn a few of the mistakes as Bret Ridgway & Frank Deardurff share information about their book. 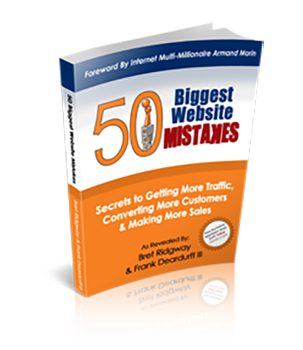 Click Here To Order A Copy of 50 Biggest Website Mistakes and start improving your online business right away. 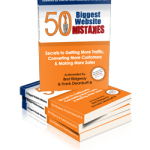 "Use This As Your Checklist..."
50 Biggest Website Mistakes’ is a must-have reference manual for all online business owners even IF you outsource all of your web design and development. This book serves as a checklist, reminder, and management tool to help you maintain control over all your projects and websites. Hand it off to new web designers and webmasters and make it required reading before doing any project. This way, you can literally turn over your websites and know that it’s done RIGHT with the marketer’s mindset! "Your Website And Business Will Improve Dramatically"
In the medical world, people turn to specialists. In the online world, I turn to Frank and Bret. They are specialists and experts when it comes to your website. Read this book, and be sure to implement each of their recommendations – your website and business will improve dramatically. "A Crash Course In The Do’s And Don’ts"
If there’s anyone who should know about websites, it’s Frank Deardurff – he has designed some of the most successful converting websites in Internet Marketing history, and continues to be two steps ahead of the game at all times ’50 Biggest Website Mistakes’ is a crash course in the do’s and don’ts of website marketing that you THINK you know already, until Frank proves how wrong you really are! Don’t assume ANYTHING – grab Frank’s book TODAY, before you make a fatal marketing error! "The Book I Should Have Written!" As someone that has been in the web design industry for over 16 years, I have to say I wish I had written this book and given it to every one of my clients before starting any project! It’s a great basic guide to all the things to do RIGHT with any website. It doesn’t matter if you have a current website or are just getting ready to build one, you MUST read this book and avoid a lot of mistakes I see every day. I appreciate so much discovering the content of this book! As a newcomer to publishing I set up my first website. I'm just so very lucky to have found this book now at the beginning instead of years down the road. There are all kinds of tips in this book, from formatting and headlines and subheadlines, to use of google analytics, to tips on hyperlinks, and search engine optimization. I have checked out my website for many of the common mistakes the authors write about and made changes that are positive. I recommend this book for anyone who has a website. Highly recommended. A simple little bible for making sure you have everything on your Website done right...from the get-go. Don't waste your time building your web presence without cross referencing every single one of these 50 easy tips. You'll save tons of time. I wish I had this book 15 years ago when I started online. Order Your Copy Right Now, You Will Be Glad You Did! Just click the order button below to be taken to our secure order page. Click Here To Order Securely Today!